Subtle aromas of ripe berry and spicy black pepper belie the richly textured flavors that follow. 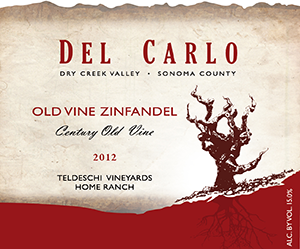 Balanced with an elegance derived from the ancient vines, this Zin offers layers and depth to the palate. A juicy core of blackberry and Bing cherry merge with mocha and hints of toasty oak, while pepper spices up the finish as the flavors linger. The complement of flavors and ideal balance make this food-friendly wine easy to pair. Try it with sautéed Italian sausages and peppers over creamy polenta or a hearty lamb stew, and for dessert a delicious vanilla zabaglione with fresh berries.